'Cold Dead Hand' is a single and accompanying music video created for Funny or Die by Jim Carrey with The Eels, playing as "Lonesome Earl and the Clutterbusters". The title is a reference to a statement Charlton Heston made while acting as spokesperson for the National Rifle Association, "I'll give you my gun when you pry (or take) it from my cold, dead hands." 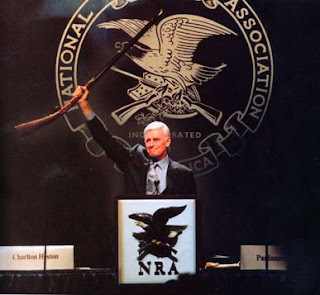 The song lampoons American gun culture, and specifically the late Heston, stating that he could not enter Heaven, as even the angels could not pry the gun from his hands. Staged as an episode of the variety program Hee Haw in which Heston is a guest star, the video also features The Eels dressed as Abraham Lincoln, Mahatma Gandhi, and John Lennon (all of whom were advocates of peace that were assassinated with guns). In a press release Jim Carrey said, "I find the gun problem frustrating and �Cold Dead Hand� is my fun little way of expressing that frustration." Cold Dead Hand. Don't be afraid. It's just a funny little song. 198 screen captures in the Gallery. MAN 1: Why did the ventriloquist quit drinking? MAN 2: Cause he acted like a real dummy. HOST: Well hi-oh and howdy fine folks; welcome back to �Hee Haw.� We want to thank our special guest Charlton Heston (Jim Carrey) for joining us. HOST: Well, we wanna leave you with the sweet as molasses sounds of a band I�m sure you�re all gonna like. Hens and roosters, lend an ear to Lonesome Earl and the Clutterbusters. leaves them warm in the snow. they�re dead and buried long before they go. and his immortal soul may lay forever in the sand. �cause they couldn�t pry that gun from his cold dead hand. JIM CARREY (AS HESTON): What did he say. JIM CARREY (AS EARL): It takes a cold dead hand to decide to pull the trigger. but we know: your chariot may not be swingin� low. into the canyon of dismay? he�d stick the vultures and coyotes. could profiteer from pain and fear. It takes a cold dead hand to decide to pull the trigger. JIM CARREY (AS ELLIOT): Hi, I�m Clearly Sam Elliot. Pay attention now braves, this boy�s got something to say, budding social satire; you couldn�t stand smooth. Enjoy the show. I�m a watch that sunset. so you need something bigger with a hairpin trigger. GIRL 1: Well what in the heck was that? JIM CARREY (AS HESTON): I accidentally shot my foot off.